For the past two years podcast have been my new favourite thing and anyone who has had the misfortune to talk to me in a party will have been bored to death by my seemingly boundless enthusiasm for the new medium (and endless desire to plug “Comedy Bang Bang”). The best thing about podcasts is that almost anyone can make one. Sadly the worst thing about podcasts is that almost *anyone* can make them and the poorly recorded sounds of giggling 20 somethings being overly pleased with their terrible in jokes fill the airwaves. Despite the terrible name, Bossjock is a pretty great podcast recording app, designed to put a pretty clever recording studio in your pocket. If you do a Collin’s and Herring style “hit play and talk” podcast then this app is not for you. But if you’re interested in exploring all the fun and wonderful things you can do with audio Bossjock is pretty amazing (listen to something like The Todd Glass Show for a good idea of just how much fun you can have with a deft sound engineer at your side). Firing up the app you’ll be presented with 8 or 16 carts (or 32 if you’re on an iPad), a fader, a “ducking” mic symbol and a lovely red record button. It’s a small thing but the record function really does look inviting and the overall simplicity does invite you to jump in and get creating – which is what you want in almost all creative technology. If you have even and inkling of what the app can do then you shouldn’t really need an manual – everything is intuitively laid out for you to simply jump in. It’s easy to loop pads, record cues and trigger samples – all without ever looking at an instruction manual. That’s great design. 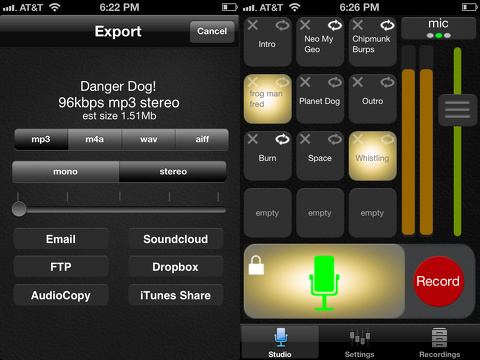 You can load sounds from multiple sources – Music Library/Recordings, Dropbox, iTunes Wifi and Audio Paste. So you could build a whole host of jingles, stings and beats just on your phone and then sprinkle them across your show. You can loop and it’s easy to clear a cart. It’s super fast and intuitive and every so often you’ll pull back and think – “wow this is a phone”. There’s a Mic icon for ducking if you want to talk over a track – and it’s really easy to configure the amount of ducking and the attack and release envelopes. You can even clear up the sound quality a little with the Low Cut filter. On the side is the giant fader which you can use to change levels on the fly and switch between the carts, mic and the overall mix. I would recommend the Blue Mikey – one of the best portable iPhone Mic’s I’ve used, even if you have to use a lighting adaptor to get it going. I would be great to use multiple mics – you are on a phone. You could actually get some multiple mic action going with a mixer – the iRig Mix is pretty lightweight and designed for iOS devices. The only downside is editing – recordings are just one solid chunk of audio so if you want to edit out something ridiculous you’ve said you’ll have to jump into GarageBand or Reaper and do it there. Other than that, if you podcast on the go, you should adore this app. 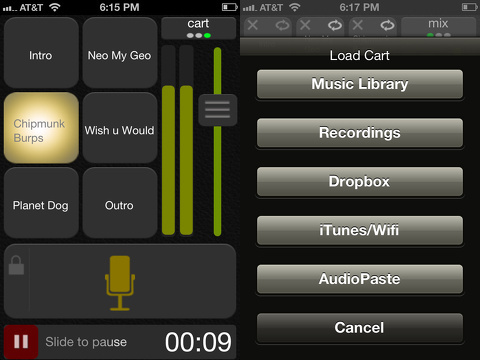 AppSafari review of Bossjock studio was written by Shem Pennant on December 17th, 2012 and categorized under App Store, Featured, iPad apps, Music, Podcasts, Universal. Page viewed 4854 times, 2 so far today. Need help on using these apps? Please read the Help Page.